1 Braves Lost 0 1 .000 -1 Aaron Nola Hector Neris Nola with 5.1 dominant innings, but pulled after 68 pitches and bullpen blew 5-0 lead and lost on 3-run walk-off homer. 2 Braves Won 1 1 .500 0 Nick Pivetta Drew Hutchison Pivetta allows 3 runs in 4 innings and bullpen blows lead again, but Santana's 11th inning sac fly gives Phils first win. 3 Braves Lost 1 2 .333 -1 Vince Velasquez Vince Velasquez Velasquez fails to finish 3 innings and allows 7 runs (4 earned), Phils allow 15 runs total, Pedro Florimon forced to pitch, and Kapler called Milner in from bullpen without warming up in 15-2 loss. 4 Mets Lost 1 3 .250 -2 Ben Lively Ben Lively Lively and bullpen were strong, but Phils mustered just 3 hits in 2-0 loss. 5 Mets Lost 1 4 .200 -3 Aaron Nola Drew Hutchison Nola fights through 5 innings, but Phils blow 2-2 tie with 2-run hit to beat drawn in Williams in right in 6th in 4-2 loss. 6 MARLINS Won 2 4 .333 -2 Nick Pivetta Nick Pivetta Pivetta throws 5.2 shoutout innings with 9 K's and no walks, and Franco homers and knocks in 4 in 5-0 win in home opener. 7 MARLINS Won 3 4 .429 -1 Vince Velasquez Vince Velasquez Jake Thompson Franco and Altherr hit grand slams, Franco hits two bombs with 6 RBI, Phils hit 5 homers, and Velasquez throws 6 one-run innings in 20-1 route. 8 MARLINS Lost 3 5 .375 -2 Jake Arrieta Luis Garcia Arrieta allows 3 runs in first inning in debut before three scoreless innings. Phils tied after 3, but Garcia and Morgan allowed 3 in 8th in 6-3 loss. 9 REDS Won 4 5 .444 -1 Ben Lively Luis Garcia Hector Neris Kingery with first MLB homer and Hoskins also homered and Phils were tied at 5-5 when Nick Williams hit solo homer with 2 outs in 8th to give Phils 6-5 win. 10 REDS Won 5 5 .500 0 Aaron Nola Aaron Nola Hernandez ended no-hitter in 6th and scored on Herrera double, Crawford ended slump with go-ahead RBI in 7th before Kingery hit first career grand slam in 8th to secure 6-1 win for Nola, who allowed 1 run in 8 innings. 11 REDS Won 6 5 .545 1 Nick Pivetta Yacksel Rios Pivetta went 7 innings and gave up 2 runs and Hector Neris blew a save in the ninth, but Scott Kingery hit a walk-off sac fly in 4-3 win to sweep Reds. 12 Rays Won 7 5 .583 2 Vince Velasquez Edubray Ramos Hector Neris Velasquez allows just one run in 6 2/3 innings, while the Phillies only scored once through 8 innings, but Jorge Alfaro's RBI single in the 9th was game winner in 2-1 victory. 13 Rays Won 8 5 .615 3 Jake Arrieta Jake Arrieta Phillies explode for 6 runs in the second inning off Chris Archer, Crawford has RBI double and solo home run, and Arrieta allowed 2 runs in 6 2/3 innings in 9-4 win. 14 Rays Won 9 5 .643 4 Ben Lively Yacksel Rios Kingery's 3-run double and Altherr's 3-run homer paced the offense, while the bullpen allowed 2 runs in five innings in relief of Lively in 10-4 win to sweep Rays. 15 Braves Lost 9 6 .600 3 Aaron Nola Aaron Nola Nola strong in 6 innings, but Phils only score once, while Herrera was thrown out at second without sliding in 2-1 loss to end 6-game winning streak. 16 Braves Won 10 6 .625 4 Nick Pivetta Hector Neris Hoskins hit game-winning 2-run double in 10th, Franco added one of his own in 5-1 win. 17 Braves Lost 10 7 .588 3 Vince Velasquez Vince Velasquez Velasquez strong but allowed 3-run homer in 5th. Phils chipped away, but a 3-run inning against Milner sealed it in 7-3 loss. 18 PIRATES Won 11 7 .611 4 Jake Arrieta Jake Arrieta Arrieta, with fantastic command and movement, allowed just one infield single in 7 innings, while Hoskins homered, Herndandez with 3-run SINGLE to score Crawford from first in 7-0 victory. 19 PIRATES Won 12 7 .632 5 Ben Lively Luis Garcia Hector Neris Lively tosses 6 one-run innings and bullpen allows none, while Herrera's 8th inning triple was game winner in 2-1 win. 20 PIRATES Won 13 7 .650 6 Aaron Nola Aaron Nola Hector Neris Nola with 7 strong innings with 2 runs allowed, Hoskins' 3-run homer in the sixth gave the Phils the lead, and they tacked on 3 more in 6-2 win. 21 PIRATES Won 14 7 .667 7 Nick Pivetta Yacksel Rios Pivetta strong with two runs allowed in 6 1/3. Tied at 2 in the 11th, Altherr hit walk-off single to complete sweep of Pirates. 22 DBACKS Lost 14 8 .636 6 Vince Velasquez Vince Velasquez Velasquez allows 4 runs in 4 1/3 innings in soggy night, the bullpen allows 4 more, and Phils struck out 16 times in 8-4 loss. 23 DBACKS Won 15 8 .652 7 Jake Arrieta Jake Arrieta Hector Neris Phillies commit 3 errors and Arrieta walked in a run as Phillies were down 3-2, but Altherr hit 3-run homer in 6th off Greinke in 5-3 win. 24 DBACKS Lost 15 9 .625 6 Ben Lively Ben Lively Lively allows 7 runs in 2.1 innings and Phils without much offense in 8-2 loss. 25 BRAVES Won 16 9 .640 7 Aaron Nola Aaron Nola Nola with rough first inning to put Phils down 3-0 but Herrera ties with 3-run homer, adds another homer, and finishes with 4 RBI, while Alfaro homers with 3 RBI. Nola finished with just those 3 runs in 7 total innings in 7-3 win. 26 BRAVES Lost 16 10 .615 6 Nick Pivetta Nick Pivetta Herrera robs homerun with catch in bushes, but that was the only excitement as Pivetta allows 4 runs in 5 innings in 4-1 loss. 27 BRAVES Lost 16 11 .593 5 Vince Velasquez Vince Velasquez Velasquez allows 6 ER in 4 innings and Phils manage just 5 hits in 10-1 loss. 28 Marlins Lost 16 12 .571 4 Jake Arrieta Jake Arrieta Arrieta allows 6 runs in 3 2/3 innings. Franco and Alfaro homer, but Phils can't catch up in 8-4 loss. 29 Marlins Lost 16 13 .552 3 Zach Eflin Yacksel Rios Zach Eflin took perfect game into the sixth, but left with game tied at 1 after allowing solo homer. Rios allowed a walk-off hit in 10th in 2-1 loss. 30 Marlins Won 17 13 .567 4 Aaron Nola Aaron Nola Nola strolls through 7 1/3 scoreless innings and Phils score 6 times in 6-0 win over Marlins. 31 Nats Lost 17 14 .548 3 Nick Pivetta Nick Pivetta Pivetta can't escape second inning and gives up 6 runs in 1+ innings. Hutchison with 5 strong innings with just one run allowed. Phils score 3 times in 6th with homers from Santana and Franco, but got no closer in 7-3 loss. 32 Nats Won 18 14 .563 4 Vince Velasquez Vince Velasquez Hector Neris Hoskins' 2-run homer in first proved enough, with one run against Velasquez in 5 innings and none against bullpen in 3-1 win. 33 Nats Lost 18 15 .545 3 Jake Arrieta Hector Neris Down 1-0 in the 7th after 6 excellent innings from Arrieta, but Scherzer strikes out 15 Phillies before getting pulled with one out in 7th, when Nick Williams hits pinch-hit double to tie, Phils score twice more in the inning and add another on Franco's home to take 4-1 into bottom of eighth, but Hunter and Garcia allow 2 runs in eighth and Neris can't record a single out in 9th in rough 5-4 walk-off loss. 34 GIANTS Won 19 15 .559 4 Zach Eflin Zach Eflin Eflin with 6 2/3 shutout innings, Herrera with 2 homers and 5 RBI, and Phils hit four homers total in 11-0 win. 35 GIANTS Won 20 15 .571 5 Aaron Nola Aaron Nola Hector Neris Nola dazzles with 12 strikeouts and just 5 hits and 1 run allowed in 7 innings, while Phils get homers from Altherr, Alfaro, and Santana in 4-2 win. 36 GIANTS Won 21 15 .583 6 Nick Pivetta Nick Pivetta Santana with 3 hits and 5 RBI, Franco with a homer and 2 RBI, and Pivetta battled through 1st and allowed no runs in 5 innings in 11-3 Phillies win. 37 GIANTS Won 22 15 .595 7 Vince Velasquez Vince Velasquez Hector Neris Velasquez allowed 2 homers and 3 runs in 1st two innings but allowed no more and struck out 12 in 6 innings. Santana hit 3-run homer to give lead in 4th Herrera had 3 hits in 6-3 win to complete 4-game sweep of Giants. 38 METS Lost 22 16 .579 6 Jake Arrieta Hector Neris Arrieta throws 7 1/3 shutout innings and Herrera's solo homer seemed enough, but Neris allowed back to back homers to blow save and lose game 3-1. 40 Orioles Won 24 16 .600 8 Nick Pivetta Nick Pivetta Pivetta strikes out 11 and allows just one run in 7 innings and Phils scored 3 times in sixth to beat Orioles 4-1 in what ended up being one game series. 41 Cardinals Won 25 16 .610 9 Vince Velasquez Vince Velasquez Velasquez pitches 6.1 scoreless innings and Dominguez with 2 big outs in 7th. Florimon's 2-run homer gave Phillies 4-1 lead in 8th, they added two more, and Ramos escaped ninth with bases loaded in 6-2 win. 42 Cardinals Lost 25 17 .595 8 Jake Arrieta Jake Arrieta Arrieta unable to overcome sloppy defense as Phils commit 3 errors and lifted after 3 innings, bullpen allows 8 runs, and Florimon pitches and hits homer in 12-4 loss. 43 Cardinals Won 26 17 .605 9 Zach Eflin Tommy Hunter Seranthony Dominguez Herrera knocked in, but a sloppy game put Phils down 6-5, but Kingery tripled and scored the go ahead run on Alfaro's RBI in 8th, and Dominguez pitched 2 innings for first career save in 7-6 win. 44 Cardinals Lost 26 18 .591 8 Aaron Nola Aaron Nola Phils amass 2 hits against Flaherty in 1-5 loss, and Herrera's on-base streak ends at 45, retired in his last at-bat with a strikeout in which he still reached first. 45 BRAVES Won 27 18 .600 9 Nick Pivetta Nick Pivetta Hector Neris After throwing lots of pitches in his first two innings, Pivetta settled down for 7 scoreless innings. Homers from Williams and Altherr all Phils needed in 3-0 win. 46 BRAVES Lost 27 19 .587 8 Vince Velasquez Vince Velasquez Velasquez struck out 9 and allowed 2 runs (1 earned) behind poor defense in 4.1 innings. Phils unable to hit McCarthy and in 3-1 loss. 47 BRAVES Won 28 19 .596 9 Jake Arrieta Jake Arrieta Phils with several 2-out hits to score 4 times, which was more than enough for Arrieta who tossed 6.2 scoreless innings in 4-0 win. 48 BL JAYS Lost 28 20 .583 8 Zach Eflin Zach Eflin Eflin struggled with 5 ER in 4.2 innings but also hit homer, Santana homered. Down 6-4 in 9th, Phils scored once and had bases loaded with one out, but Hoskins struck out and Herrera grounded out in 6-5 loss. 49 BL JAYS Won 29 20 .592 9 Aaron Nola Seranthony Dominguez Luis Garcia Nola took no-hitter into 7th, Nick Williams hit game-winning solo homer in 8th, and Garcia earned save in 2-1 win to put Phils in first place. 50 BL JAYS Lost 29 21 .580 8 Nick Pivetta Nick Pivetta Pivetta with 2 runs allowed in 5 innings and Hunter with 2 allowed to put Phils down 4-0 before scoring 3 times to get within one, but Neris allows homer and Phils don't score again in 5-3 loss. 51 Dodgers Lost 29 22 .569 7 Vince Velasquez Adam Morgan Hernandez's homer in 2nd gave Phils 4-0 lead and Velasquez took no-hitter into sixth and Phils had 4-2 lead entering 8th, but a few fluky plays helped Dodgers to 3-run 8th and Phils lose 5-4. 52 Dodgers Won 30 22 .577 8 Jake Arrieta Jake Arrieta Arrieta allowed 6 hits in 7 scoreless innings, while Williams hit solo homer and Herrera had 2-run single in 6-1 win. 53 Dodgers Lost 30 23 .566 7 Zach Eflin Zach Eflin Eflin allowed 5 runs in 4 innings and Phils didn't create much offense in 8-2 loss. 54 Dodgers Won 31 23 .574 8 Aaron Nola Aaron Nola Seranthony Dominguez Despite a high pitch count in first, Nola pitched seven brillian innings with just one run, Phils "scored" in fifth even though Franco never touched the plate, Alfaro knocked in Kingery with double in 7th to take 2-1 lead and Dominguez kept it that way with a two-inning save. 55 Giants Lost 31 24 .564 7 Nick Pivetta Nick Pivetta Pivetta labored through 4 innings with 3 runs and Phils offense listless, while Cozens got first MLB hit in 4-0 loss. 56 Giants Lost 31 25 .554 6 Vince Velasquez Vince Velasquez Phils with just 3 hits and no walks in 2-0 shutout loss to Giants, wasting 6.1 fantastic innings by Velasquez. 57 Giants Lost 31 26 .544 5 Jake Arrieta Jake Arrieta Phils scored just once in entire thanks to Arrieta's solo homer, and after cruising through the first 5 innings, a 5-run sixth does him in. Arrieta criticized offense and shifts in "horse bleep series" in 6-1 loss. 58 Cubs Won 32 26 .552 6 Zach Eflin Zach Eflin Nick Williams' 2-run homer in first all Phils needed for 6-1 victory. Eflin went 7.2 innings with one run allowed and Phils scored 5 runs and knocked Kendrick out after 5. 59 Cubs Lost 32 27 .542 5 Aaron Nola Adam Morgan Nola battled through 6 innings and Phils were down 3-0 until Altherr hit 3-run homer in sixth. Dylan Cozens hit first career homer in 9th for 5-3 lead, but Morgan allowed walk-off grand slam to Heyward in 7-5 devastating loss. 60 Cubs Lost 32 28 .533 4 Nick Pivetta Nick Pivetta Phils with 7 walks and 4 hits against Chatwood, but only scored once off him. Pivetta allowed 6 hits and 4 runs with some tough luck in 5 innings. Phils came within 1 after Kingery's 2-run double, but couldn't get closer in 4-3 loss. 61 BREW Lost 32 29 .525 3 Vince Velasquez Vince Velasquez Velasquez lets in 10 in 3.2 in 12-4 loss. 62 BREW Lost 32 30 .516 2 Jake Arrieta Jake Arrieta 3-run homer by Hoskins gives Phils 3-2 lead in 3rd, but Garcia comes in to relieve Arrieta and allows grand slam in sixth in 12-3 loss. 64 ROX Won 34 30 .531 4 Aaron Nola Aaron Nola Seranthony Dominguez Kingery hit 3-run homer and Nola and allowed one run in 6.2 innings. With 5-1 lead, Garcia loaded bases with no outs and Dominguez came in and barely escaped with 5-4 win. 65 ROX Lost 34 31 .523 3 Nick Pivetta Nick Pivetta Pivetta allows 5 runs in 5th in 7-2 loss. 66 ROX Won 35 31 .530 4 Vince Velasquez Vince Velasquez Velasquez took no-hitter into 7th and finished with 2 runs in 6.2, Hoskins and Williams homered, and 4-run 7th gave cushion in 9-3 win and first series win since Braves series on 5/21-5/23. 67 Brewers Lost 35 32 .522 3 Jake Arrieta Jake Arrieta Arrieta with disastrous 2nd and 4th innings and allowed 8 runs (4 earned) along with sloppy defense. Valentin pitched 9th and allowed 3 runs in 12-3 loss. 68 Brewers Won 36 32 .529 4 Zach Eflin Zach Eflin Hector Neris Hoskins and Knapp go yard, while Efflin allows just a run in 5 innings and bullpens allows none in 4-1 win. 69 Brewers Won 37 32 .536 5 Aaron Nola Tommy Hunter Jake Thompson Nola struggled with 4 runs in 4.1 in a game in which Brewers reliever Adrian Houser puked on mound, Franco homered and knocked in four and Hoskins and Herrera also homered to give Phils 10-5 lead in 9th. Neris allowed 4 runs in ninth before Thompson came in for one out save. 70 CARDS Won 38 32 .543 6 Nick Pivetta Jake Thompson Pivetta fanned career high 13 and allowed 2 runs in 7.1 and Phils had 4-2 lead after 8. In 9th, Arano struck out the side but run scored when Knapp dropped strike 3, then Morgan allowed tying run to score. Thompson allowed homer in 10th, but Phils won on walk-off double on missed dive by Ozuna in wild 6-5 win. 71 CARDS Lost 38 33 .535 5 Vince Velasquez Seranthony Dominguez Velasquez was solid and left with 4-2 lead after 6.1, but Hunter allowed both inherited runners plus two more to score in 7th. Hoskins tied game with two-run double, but Dominguez allowed solo homer in 9th in 7-6 loss. 72 CARDS Won 39 33 .542 6 Jake Arrieta Edubray Ramos Adam Morgan 2-run homer by Hernandez gave Phils 3-1 lead before Arrieta allowed game-tying 2-run homer in 6th. Bullpen pitches three shutout innings and Herrera gave Phils lead with solo homer in 7th in 4-3 win. 73 Nationals Won 40 33 .548 7 Zach Eflin Zach Eflin Herrera goes 4-for-5 and homers for 5th straight game, Santana and Knapp also go deep, Eflin allows 2 runs in 5 innings and the bullpen throws 4 shutout innings in 12-2 win. 74 Nationals Won 41 33 .554 8 Aaron Nola Aaron Nola Seranthony Dominguez Franco went 4-for4, beat two throws at the plate, and singled the last Phillies run, while Nola had a solid 2-run, 6-inning outing in 5-3 win. 75 Nationals Lost 41 34 .547 7 Nick Pivetta Seranthony Dominguez In first Sunday Night game since 2013, homers from Hoskins and Williams and a 2-run triple by Herrera gave Phils 6-2 lead in 5th, but Ramos and Davis allowed 3 runs in 6th and Arano and Dominguez allowed 3 in 8th in heartbreaking 8-6 loss. 76 YANKEES Lost 41 35 .539 6 Vince Velasquez Vince Velasquez Velasquez with solid 2 runs in 6 innings, but down 2-0 in 8th, Morgan loaded bases with no outs and Rios allowed two baserunners to score, while offense mostly lifeless in 4-2 loss. 77 YANKEES Lost 41 36 .532 5 Jake Arrieta Jake Arrieta Homer from first batter was all Yankees needed in 6-0 Phillies loss. Arrieta allowed a run in the first, three more in third thanks in part two missed double play, and 6 total, while Phils were dominated by Severino. 78 YANKEES Won 42 36 .538 6 Zach Eflin Zach Eflin Seranthony Dominguez Eflin dominated Yankees with 7 shutout innings and Rhys Hoskins hit 3-run homer in 3-0 win. 79 NATS Won 43 36 .544 7 Aaron Nola Aaron Nola Seranthony Dominguez Nola fired 7.2 strong frames with 1 run against for 10th win and Hoskins' homer provided late cushion in 4-3 win. 80 NATS Lost 43 37 .538 6 Nick Pivetta Nick Pivetta Pivetta couldn't escape 2nd inning and allowed 7 runs, Neris allowed 3 homers and 5 runs in 9th, and homers from Hoskins, Kingery, and Santana not enough in 17-7 loss. 81 NATS Won 44 37 .543 7 Vince Velasquez Victor Arano Seranthony Dominguez Velasquez left after 2 after getting hit by liner and throwing out Eaton with left hand. Herrera's solo homer in 3rd helped Phils to 3-1 lead after 4 and bullpen allowed just one run in 7 innings in 3-2 win. 82 NATS Won 45 37 .549 8 Jake Arrieta Nick Pivetta Down 3-0 in fifth after sloppy defense, Kapler pulled Arrieta and Phils scored 3 runs to tie, bullpen tossed 8 scoreless innings including 1 from Nick Pivetta, and Knapp hit pinch-hit walk off homer in 13th in 4-3 win. 83 ORIOLES Won 46 37 .554 9 Zach Eflin Zach Eflin Seranthony Dominguez Eflin with 7 easy innings of 2-run ball.Tied at 2 in the 4th, Knapp's triple proved to be the winner in 3-2 victory. 84 ORIOLES Won 47 37 .560 10 Aaron Nola Aaron Nola Victor Arano Phils muster just 3 hits and score two runs off error, but 2-run homer from Williams, 7 1-run innings from Nola, and Arano's first career save for two innings enough for 4-1 win. 85 Pirates Won 48 37 .565 11 Nick Pivetta Edubray Ramos Despite a shaky performace from Pivetta who left in the third, Phils score 17 runs in the longest 9-inning game in Phillies history with 3-run homers from Herrera and Knapp, 4 hits from Kingery, and solid bullpen in 17-5 route. 86 Pirates Won 49 37 .570 12 Jake Arrieta Jake Arrieta Victor Arano Down 2-0 and lifeless offensively, Phils score 3 times in the 7th and take the lead on Alfaro's RBI double. Arrieta went 7 innings with 2 runs and bullpen locked down the win. 87 Pirates Lost 49 38 .563 11 Drew Anderson Drew Anderson Winning streak ends at 6, as Phils muster 4 hits and 1 run, while spot starter Drew Anderson allowed 4 runs in 5 innings in his first MLB start in 4-1 loss. 88 Mets Lost 49 39 .557 10 Zach Eflin Victor Arano Tied at 3 in 10th, Wilmer Flores hit walk-off homer off Arano for a loss in game 1 of doubleheader. 89 Mets Won 50 39 .562 11 Aaron Nola Aaron Nola Nola did it all, just allowing one hit and no runs in seven innings and hitting a three-run double for the only offense in 3-1 win. 90 Mets Won 51 39 .567 12 Enyel De Los Santos Enyel De Los Santos In game of MLB debuts for both starters, De Los Santos pitched 6.1 innings with 3 runs allowed, while Franco hit 3-run homer in 4 RBI night and Williams added 2-run single in 7-3 win. 91 Mets Lost 51 40 .560 11 Vince Velasquez Mark Leiter Velasquez equals deGrom in pitchers duel with 6 shutout innings, but Phils fail to score and Leiter allows walk-off homer in 10th. 92 Orioles Won 52 40 .565 12 Nick Pivetta Nick Pivetta Seranthony Dominguez Alfaro's homer and 3 RBI helped stake Phils to 5-0 lead. Orioles scores three times off Pivetta and Hunter in 7th, but Phils hold on for 5-4 win. 93 Marlins Won 53 40 .570 13 Jake Arrieta Jake Arrieta Pat Neshek Arrieta tosses 7 shutout innings, and an RBI double from Altherr and a homer from Franco enough for 2-0 win. 94 Marlins Lost 53 41 .564 12 Aaron Nola Aaron Nola Nola allowed 2 runs in the first inning and that was all the Marlins needed. Nola went 6 but the Phils scored nothing in 2-0 loss. 95 Marlins Lost 53 42 .558 11 Enyel De Los Santos Edubray Ramos Phils took 5-0 lead in fourth thanks mostly to Hernandez 3-run triple, but those were the only hits they would get in the game, De Los Santos and Ramos combined to allow 8 runs in the 5th, Santana made throwing error and also forgot outs in ugly 10-5 loss at the break. 96 PADRES Won 54 42 .563 12 Jake Arrieta Austin Davis Arrieta allowed 4 hits and Phils committed 2 errors in first, but Phils score 6 times in 2nd with 2-run single from Herrera and 3-run homer from Santana in 11-5 win. 97 PADRES Lost 54 43 .557 11 Nick Pivetta Nick Pivetta In game one of doubleheader, Pivetta allows 6 runs (4 earned) in 5.1 innings. Hoskins hits solo homer, but Phils score just 2 runs and bullpen allows 4 runs in 10-2 loss. 98 PADRES Won 55 43 .561 12 Vince Velasquez Vince Velasquez In game 2, Velasquez tossed 7 shutout innings and carried no-hitter into sixth. Herrera and Hoskins homered in 5-0 win. 99 DODGERS Lost 55 44 .556 11 Zach Eflin Seranthony Dominguez Eflin struggled through 2.2 innings and Phils were down 4-1 in 5th before homers by Hoskins and Herrera put Phils up 5-4, but Hunter allowed a run in 7th and Dominguez allowed 2 run in tied game in 9th in 7-6 loss. 100 DODGERS Won 56 44 .560 12 Aaron Nola Vince Velasquez Nola allowed 3 runs behind shaky defense in 5 innings and Phils were down 4-1 in 7th, but an RBI double by Franco and 2-run blast by Alfaro tied game. Phils finally win in 16th inning on Trevor Plouffe's 3-run walk-off homer off position player in 7-4 win. Velasquez pitched final inning to get win. 101 DODGERS Won 57 44 .564 13 Jake Arrieta Jake Arrieta Seranthony Dominguez Kingery hit solo homer and Santana hit 3-run triple in 5th, which was enough behind Arrieta's 6 inning with 3 runs in 7-3 win. 102 Reds Won 58 44 .569 14 Ranger Suarez Ranger Suarez Phillies match franchise record with 7 homers and 2 from Franco, Hoskins, and Williams. Ranger Suarez makes MLB debut and allows 4 runs in 5 innings as first lefty starter for Phils since 2016 in 9-4 win. 103 Reds Lost 58 45 .563 13 Nick Pivetta Nick Pivetta Pivetta gives up 5 runs in 6 innings. Herrera hits 2-run homer in 3rd but not enough in 6-4 loss. Phils aquire Asdrubel Cabrera before game. 104 Reds Lost 58 46 .558 12 Vince Velasquez Tommy Hunter Hoskins' 2-run homer was only Phils offense. Velasquez with 2 runs in 5 innings, but Hunter allowed 2 and Davis allowed 3 in 6-2 loss. 105 Reds Lost 58 47 .552 11 Zach Eflin Zach Eflin Phils blanked by Luis Castillo and Eflin allows 4 runs in 5.1 innings in 4-0 loss. 106 Red Sox Lost 58 48 .547 10 Aaron Nola Austin Davis Nola dominates Red Sox, but Herrer's 3-base mistake allowed a run in the fifth and the Phils scored just one run and lost on walk-off ground rule double in 13th in 2-1 loss. 107 Red Sox Won 59 48 .551 11 Jake Arrieta Jake Arrieta Arrieta deliveres 1-run outing in 7 innings and Phils scored 3 runs in 3-1 win. 108 MARLINS Won 60 48 .556 12 Nick Pivetta Tommy Hunter Pivetta allowed just a 2-run homer in six innings, but Phils were down 2-1 entering 9th, but Williams RBI groundout tied game and Franco's first career walk-off homer gave Phils 5-2 win. 109 MARLINS Won 61 48 .560 13 Vince Velasquez Vince Velasquez Velasquez went 6.1 scoreless, doubled and scored, and Quinn's 2-run double in 8th gave some breathing room in 5-2 win on Victorino's retirement night. 110 MARLINS Won 62 48 .564 14 Zach Eflin Zach Eflin On Wall of Fame night for Halladay and Gillick, Eflin throws 8 dominant innings and Phils hit four homers in 8-3 win. 111 MARLINS Won 63 48 .568 15 Aaron Nola Pat Neshek Tommy Hunter On the 2008 reunion, Phillies took 3-0 lead with 2-run single by Herrera and RBI from Franco in 6th, but Marlins tied with 2 homers in seventh. Cabrera broke tie with 2-run homer in 8th in 5-3 win to sweep Marlins. 112 Dbacks Lost 63 49 .563 14 Jake Arrieta Austin Davis Arrieta with 8 shutout innings and Herrera's RBI triple and run scored gave Phils 2-0 lead, but Dominguez blew save in 9th and Phils lost on walk-off homer in 14th. 113 Dbacks Won 64 49 .566 15 Nick Pivetta Nick Pivetta Pat Neshek Pivetta outduels Greinke with 6 shutout innings and left with 1-0 lead after Williams' 3rd inning homer. Cabrera's 2-run double added insurance in 4-run 8th and 5-2 win. 114 Dbacks Lost 64 50 .561 14 Vince Velasquez Vince Velasquez Velasquez allows 4 runs in 4 innings and Phils get nothing off Corbin in 6-0 loss. 115 Padres Lost 64 51 .557 13 Zach Eflin Zach Eflin Eflin pitched well against his former team with 2 runs in 6 innings, but Phils blanked again in 2-0 loss. 116 Padres Won 65 51 .560 14 Aaron Nola Aaron Nola Nola battles through 6 shutout innings, while Williams' RBI triple, Cabrera's RBI double, and Franco's solo homer helped Phils to 5-1 win. 117 Padres Lost 65 52 .556 13 Jake Arrieta Jake Arrieta Phillies commited 2 errors and fumbled several more, allowed 6 steals, and Arrieta allowed 3rd inning grand slam in 9-3 loss. 118 RED SOX Lost 65 53 .551 12 Nick Pivetta Tommy Hunter Phils no-hit through 4 until Hoskins homer tied game at 1. Pivetta allowed 1 run in 6 innings, but Phils scored just once and Hunter allowed a deciding solo homer in 8th in 2-1 loss. 119 RED SOX Won 66 53 .555 13 Vince Velasquez Tommy Hunter Velasquez allowed 3-run double in 3rd to put Phils down 3-0 and only lasted 2.1 innings, but the bullpen pitched 6.2 scoreless and Ramos went 3-for-4 with 3 RBI in Phils debut, as Phils come back for 7-4 win. 120 METS Lost 66 54 .550 12 Ranger Suarez Ranger Suarez Phils commited 4 errors, allowed 11 unearned runs, Suarez allowed 8 runs, Leiter allowed 7 runs, Quinn and Kingery pitched, and Phils hit 3 homers in 24-4 loss to Mets on game one of doubleheader. 121 METS Won 67 54 .554 13 Zach Eflin Zach Eflin Eflin gave up 2 runs and 3 doubles on first four pitches, but Hoskins hit 3-run homer in bottom of first to give lead, Kingery homered in 3-run second, and Eflin settled down for 4 runs in 6.2 innings in 9-6 win. 122 METS Won 68 54 .557 14 Aaron Nola Aaron Nola Pat Neshek Nola fans 11 and allows 1 run in 7 innings, Phils score 3 times in first, and Neshek gets save in 4-2 win. 123 METS Lost 68 55 .553 13 Jake Arrieta Jake Arrieta Arrieta allowed just one run in 6 innings, but deGrom allowed 1 in 9 innings and Garcia allowed 2 runs in 7th to seal game in 3-1 loss in which Herrera made baserunning blunder. 124 METS Lost 68 56 .548 12 Nick Pivetta Nick Pivetta In Little League Classic in Williamsport, Pivetta allowed 6 ER in 3.2 innings and Phils score just twice in 8-2 loss. 125 NATS Lost 68 57 .544 11 Vince Velasquez Victor Arano After Velasquez allowed just one run in 4 innings which was shortened due to rain delay, Phils took 4-1 lead in sixth with a homer from Quinn and RBIs from 3 others, but Morgan and Arano allow 5 runs in 6th and Nats tack on 4 more runs in 10-4 loss. 126 NATS Lost 68 58 .540 10 Zach Eflin Seranthony Dominguez Phils took 3-0 lead with 2-run homer from Franco in first, but Eflin labored through 3.1 innings and left with game tied at 4. Phils led by one entering ninth and Dominguez got the first two outs before allowing a double and a walk-off homer to Zimmerman in tough 8-7 loss. 127 NATS Won 69 58 .543 11 Aaron Nola Aaron Nola Pat Neshek Aaron Nola outdueled Max Scherzer, allowing just one run in 8 innings. Herrera's 2-run homer was all the Phils needed in 7th and Neshek got the save in 2-0 win to end 4-game losing streak. 128 Bl Jays Lost 69 59 .539 10 Jake Arrieta Jake Arrieta Homers in second and third innings off Arrieta proved to be enough as Phils went 1-for-8 with RISP and scored twice in 4-2 loss. 129 Bl Jays Lost 69 60 .535 9 Nick Pivetta Seranthony Dominguez Phils had 13 hits and took a 5-0 lead in 4th, but Pivetta allowed 3 runs in the 4th and another 2 in the 7th. Still with 6-5 lead in 8th, Dominguez loaded the bases and Arano allowed bases clearing double, and Phils blew 5-run lead in 8-6 loss. 130 Bl Jays Won 70 60 .538 10 Vince Velasquez Vince Velasquez Back-to-back homers from Hoskins and Santana gave Phils early lead and two-run homers from Franco and Ramos helped the Phils to 8 runs. Velasquez allowed 2 runs in 5 innings and bullpen did the rest in 8-3 win. 131 NATS Lost 70 61 .534 9 Zach Eflin Zach Eflin Phils tie game at 2 in 3rd with RBI triple and run from Quinn. Error by Eflin on play at plate leads to two runs in 4th on way to 5-3 loss. 132 NATS Lost 70 62 .530 8 Aaron Nola Pat Neshek Nola outdueld Scherzer once again and Phils took 3-0 lead with homers from Herrera and Alfaro. Error by Santana on play at plate led to 2 runs and Phils lead was 3-2. Neshek blows save in 9th with 2-run homer and allowed another run to make it 5-3 Nats. After Ramos double cut defecit to one run, pinch-runner Velasquez tagged too early on fly ball for final out. 133 NATS Won 71 62 .534 9 Jake Arrieta Seranthony Dominguez Tommy Hunter Phils take 2-0 lead on Arrieta RBI single before Arrieta allowed two homers to put Phils down 4-2. Santana grand slam in 5th gave Phils lead and they held on for 8-6 win. 134 CUBS Won 72 62 .537 10 Nick Pivetta Pat Neshek Pivetta allows 1 run in 5 innings and Phils were tied in 10th before Asdrubal Cabrera hit walk-off homer for 2-1 win. 135 CUBS Lost 72 63 .533 9 Zach Eflin Zach Eflin Eflin allows 4 runs (3 earned), Phils commit 2 errors, and they score just once in 7-1 loss. 136 CUBS Lost 72 64 .529 8 Aaron Nola Aaron Nola Nola allows 4 runs and 3 solo homers in 5.2 innings, bullpen allows four more, and Phils score one 9th inning run in 8-1 loss. 137 Marlins Lost 72 65 .526 7 Vince Velasquez Vince Velasquez A 3-run inning off Velasquez, who went 5, was more than enough for Marlins as Phils score just once on a homer from Cabrera in 3-1 loss. 138 Marlins Won 73 65 .529 8 Jake Arrieta Jake Arrieta Santana's leadoff homer and Hernandez' 3-run triple set the table for Phils, who scored 9 times in 9-4 win. 139 Marlins Lost 73 66 .525 7 Nick Pivetta Nick Pivetta After Atlanta blew 6-run lead entering 8th, ending a 0-487 record this season in that situation, Pivetta allows 2 runs in 4 innings and Phils score just one 8th inning run to ruin 4 scoreless innings from bullpen in 2-1 loss. 140 Mets Won 74 66 .529 8 Aaron Nola Aaron Nola Tommy Hunter Phils took 2-1 lead in 3rd with Santana homer, a 3-2 lead in 6th after Cabrera RBI single, and after Mets tied again, Hoskins' solo homer gave Phils 4-3 win. Nola allowed 3 runs in 7 innings and Hunter closed it out in 9th. 141 Mets Lost 74 67 .525 7 Zach Eflin Zach Eflin Eflin allows 3-run double, 3-run double, and 6 runs total in 3 innings off Syndergaard. Phils offense garnered 12 hits and 6 walks, but only scored 5 runs in 10-5 loss. 142 Mets Lost 74 68 .521 6 Vince Velasquez Vince Velasquez After deGrom was scratched due to rain, Phils led 2-0 after Hoskins 2-run homer, but Velasquez allowed 5 runs in 4 innings in 6-4 loss. 143 NATS Lost 74 69 .517 5 Nick Pivetta Nick Pivetta After original game cancelled because field not ready, Phils get shut down by Fedde and Nats bullpen in first game of doubleheader. Nick Pivetta allowed 1 run in 4.1 and 6 relievers allowed 2 runs in 3-1 loss in front of empty crowd. 144 NATS Lost 74 70 .514 4 Jake Arrieta Yacksel Rios In game 2, Nats jump to 3-0 lead, but Phils score 5 times in 5th and bring 6-3 lead in 9th, but Dominguez allows 5 baserunners and Garcia walked in tying run. Rios allows homer to Soto in 10th and Phils lose both games of doublheader to fall 6.5 games out. 145 NATS Lost 74 71 .510 3 Aaron Nola Aaron Nola Nola allows 2 homers and 4 runs in 5 innings and Phils only get one run on a homer from Crawford, who had 3 of Phillies 5 hits in 5-1 loss and three game sweep by the Nats. 146 MARLINS Won 75 71 .514 4 Zach Eflin Zach Eflin Altherr hits 2 homers, knocks in 5, Walding gets first MLB homer, and Eflin allows 1 run in 6.1 innings in 14-2 route to end 5-game skid. 147 MARLINS Won 76 71 .517 5 Vince Velasquez Luis Garcia Pat Neshek Velasquez only last through 2 innings after allowing 4 runs, but Phils score twice on 2-run single from Bour in 2nd and take 5-4 lead after Hernandez' 3-run homer in 5th. 7 relievers pitch 7 scoreless innings and Phils win first series in a month. 148 MARLINS Lost 76 72 .514 4 Nick Pivetta Nick Pivetta Hernandez led off with homer, but Pivetta allowed 2-run homer after 2-out error in 4th, another in the 5th, and Garcia allowed 3 runs in 6th to put Phils down 6-1. Phils added 3 runs late, but not enough in 6-4 loss. 149 METS Lost 76 73 .510 3 Jake Arrieta Tommy Hunter Mets took 4-0 lead off Arrieta in 5th, but Crawford 3-run triple capped 4-run 5th to tie the game at 4. That's all the Phils would score, and Hunter allowed a run, Neris allowed 3, and Davis allowed another in 9-4 loss. 150 METS Won 77 73 .513 4 Aaron Nola Pat Neshek Hector Neris Down 2-0 in 6th, RBIs from Ramos and Bour tied the game before Alfaro hit 3-run homer and Phils held on for 5-2 win. 151 METS Won 78 73 .517 5 Zach Eflin Zach Eflin Eflin pitches 5 shutout innings and the bullpen tosses four more, while homers from Hoskins and Herrera lead to 4-0 win. 152 Braves Lost 78 74 .513 4 Vince Velasquez Tommy Hunter Phils take 1-0 lead in first, but misplays by Santana and Hoskins give Braves 2-1 lead. Phils score twice in 3rd and allow a run for a tie after three innings, but Phils failed to score again, and Hunter allows a run and Garcia allows 4 in 8-3 loss. 153 Braves Lost 78 75 .510 3 Nick Pivetta Pat Neshek Hernandez hit solo homer in 1st and Phils were tied at 1 through 6 before scoring 3 runs thanks to misjudged ball by Acuna, but Neshek allowed a 2-run homer and 4 runs and Avilan allowed another. Phils score run in 9th but lose 6-5 to put magic number at 2. 154 Braves Lost 78 76 .506 2 Jake Arrieta Jake Arrieta Arrieta allows 4 runs in 2 innings and Phils are no-hit through 6 innings. Phils score 3 runs in 8th but not enough as Braves clinch division. 155 Braves Lost 78 77 .503 1 Aaron Nola Aaron Nola Nola allows 2 runs in 6 innings, but Phils score once on Kingery's homer in 2-1 loss. 156 Rockies Lost 78 78 .500 0 Zach Eflin Zach Eflin Eflin allowed 5 runs in 3rd, Phils score just once on Hoskins' homer, and drop to .500 in 10-1 loss. 157 Rockies Lost 78 79 .497 -1 Vince Velasquez Vince Velasquez Velasquez lasted just 3 2/3 innings as he allowed six runs on eight hits and Phils scored three times in 10-3 loss to fall below .500. 158 Rockies Lost 78 80 .494 -2 Nick Pivetta Nick Pivetta Marquez strikes out first 8 Phillies to tie a major league record, Phils get shut out, Pivetta allows 6 runs in 4.2 innings, and bullpen allows 8 more runs as Phils lose 14-0. 159 Rockies Lost 78 81 .491 -3 Jake Arrieta Jake Arrieta Arrieta allows 2 homers and 3 runs in first two innings before settling down for same total in 6 innings. Hunter allowed 2 runs and Santana hit 2-run homer, but it wasn't enough as Phils go winless on road trip and losing streak is 8 after 5-3 loss. 160 BRAVES Lost 78 82 .488 -4 Jerad Eickhoff Jerad Eickhoff Eickhoff tied club record with 7 straight strikeouts and shutout the Braves through 3 and finished with 2 runs against in 3.1 innings. 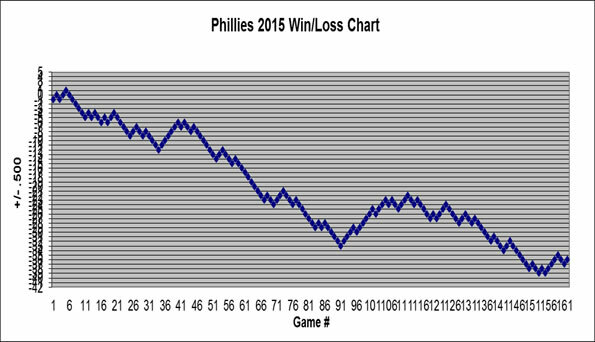 Phils gave up 4 runs in 4th on their way to 10-2 loss that guarantees a losing season. 161 BRAVES Won 79 82 .491 -3 Aaron Nola Aaron Nola Seranthony Dominguez Nola pitches 7 scoreless innings of one-run ball and gets his 17th win, while Hernandez's 2-run single in seventh was enough in 3-0 win that ended 9-game losing streak. 162 BRAVES Won 80 82 .494 -2 Ranger Suarez Tommy Hunter Seranthony Dominguez Cesar led off with homer, Suarez allowed 1 run in 3 innings and bullpen pitched 6 shoutout innings and Phils win finale 3-1.
Who do you expect to be traded by the deadline?